Two absolute beauty gems that I found when I was packing up my office. Both empty, actually, but I often hang on to empties to remind myself to repurchase! 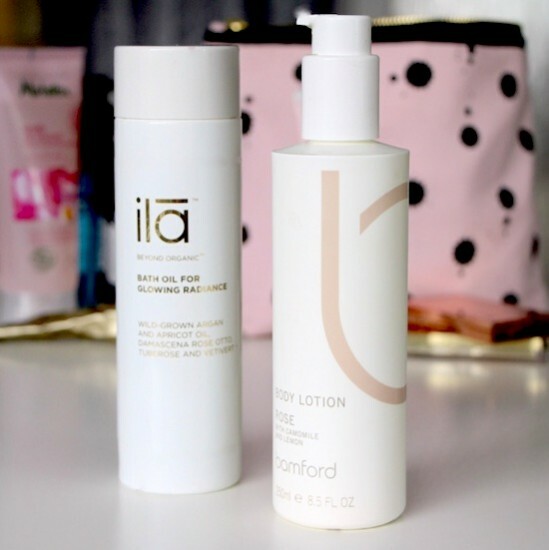 I have talked about the ILA Spa Bath Oil for Glowing Radiance before – it is just gorgeous. A very heady scent of tuberose that’s a far cry from your classic rose-scented bath oil. This feels like a true treatment product and it’s also incredibly luxurious – the bottle weighs about three kilos and that’s empty! (Exaggeration, obviously, but I’m probably not far off.) You can find my original review on this here – my thoughts have not changed. It’s £50 from John Lewis here. Bamford’s Rose Body Lotion also has a slightly different take on the classic scent; this one is lemony and as light and fresh as ILA Spa’s bath oil is heady and rich. The texture of this body lotion is wonderful and I used it every day from the day I opened it until the day it ran out. I rarely have that kind of sticking power with a body product! I was sad to see that it seemed to have been discontinued but then I noticed that it had perhaps come back in a different incarnation; as a hand and body cream. I do hope that they haven’t messed with the formula! If anyone has tried both then please do let me know – hopefully the change in packaging is a good one, because the bottle above was very difficult to use. Spout was too short. You can find the new version of the product (if indeed that is what it is) here. Previous Post Something Frivolous and Cheery.